Centers that make outgoing calls to current and prospect clients are known as an outbound call or contact centers. These centers make calls to purchasers about proactive aid and for inquiry reasons instead of receiving calls. With the use of cloud-based outbound call center software, corporations actively engage with their clients. With Nectar Desk as outbound call center software, innovating combinations with top notch telephony solutions and organization becomes available. It delivers proactive support and allows you to control new businesses from a common platform on which you can manage client communication channels simultaneously. Making outbound calls provides proactive support. Contacting people before problems arise will gain the trust of clients. To ensure your company delivers exquisite assistance, you must ask customers how you can fulfill their wants. The outbound call center provides the platform to conduct in-depth telephone surveys. These calls allow you to nurture friendly relations with buyers. When it is time to renew a package, a telephone call offers a convenient way to inform your customers and arrange for extra customer opportunities. The outbound call center software enables your company to incorporate data about clients during every call and follow their success rates. While enterprises feel that actual time phone call conversations are effective, it is essential that these calls are made at a good time in the right way through the operation of call administration like predictive dialer that decreases costs and improves productivity. Company phone calls are seen as disturbances so it is essential that phone conversations are short and concise. There must be a reason to call to avoid annoying the client. By using track metrics, you can work out patterns that bring the highest profits with the outbound call center software. If your corporation is looking to interact with buyers for the purpose of avoiding problems, encouraging expansion and giving better service to clients, the outbound call center software is worthy of attention. All the work progress will be incorporated into the system at a single location making every call just that much more effective. Your outbound call center needs to operate at a higher level than the competition. 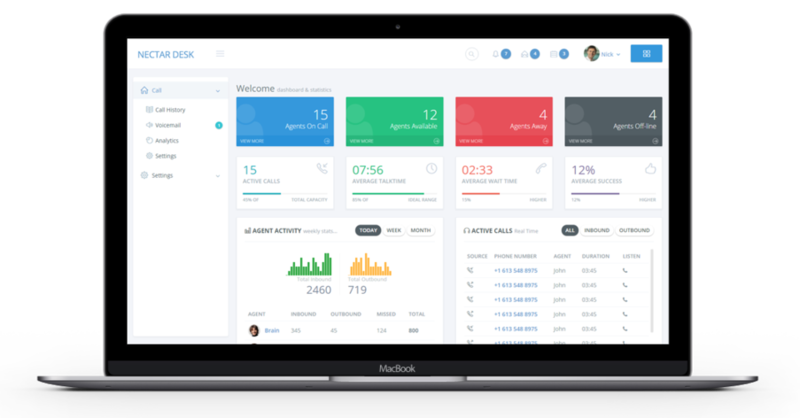 Call center analytics, call tracking, performance tracking, and all of the standard call center features are hard to come by in one product. We also make life easier for your management staff. Staffing at the appropriate hours is hard to predict. With our predictive call analytics dashboard, we give your managers the tools to evaluate agent performance, staff accordingly, and schedule optimally. Instead of hiring an outsourced contact center, you can control your own outbound call center with the help of Nectar Desk. Ouraffordable pricing shows that Nectar Desk is the right solution for your call center. The choice is obvious. Join today and get started with Nectar Desk.